The way I heard the story, in response to complaints of baseball purists that actor Ray Liotta’s portrayal of baseball legend “Shoeless” Joe Jackson batting right and throwing left was in contrast to the fact that he batted left and threw right, Field of Dreams director Ron Shelton quipped, “Did they notice he is currently dead? I guess that’s another mistake we made.” Or words to that effect. I had to remind myself of that story frequently while reading Seth Grahame-Smith’s Abraham Lincoln, Vampire Hunter. This book requires the suspension of a whole lot of disbelief. After the vampire-induced death of his mother, Abe devotes himself to the eradication of the creatures from the country. Abe’s father’s inability to repay a debt to his vampire loan shark (the senior Lincoln’s many faults were frequently referred to, as were the positive traits he passed on to his son) is what led to Nancy Hanks’ murder. It turns out that vampires were the movers and shakers, the money-lenders, the men behind the men in 19th century America, though they stretched back all the way to Sir Walter Raleigh’s Roanoke settlement. They also played a role in the institution of slavery, striking deals with human slaveholders for prey. 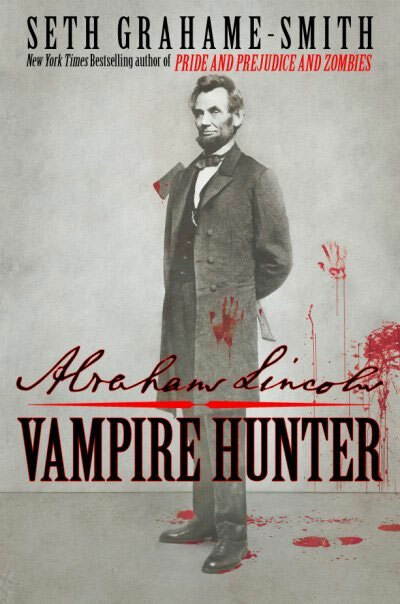 Abe was a self-taught vampire hunter at first, but early on was trained by a friendly bloodsucker. He hunted with crossbow and knives, but his weapon of choice was his trusty axe. Over the years, he enlisted the help of first Jack Armstrong of Clary’s Grove, then friend Joshua Speed, and later Ward Hill Lamon. But none of them could help Abe during what would be his last confrontation with the undead in Ford’s Theater in April, 1865. Or was it his last? The military career of Edgar Allan Poe is discussed. Grahame-Smith states that when Poe was transferred to Ft. Moultrie in South Carolina, he was not near a town. Ft. Moultrie is hard-by Charleston. Grahame-Smith describes Lincoln’s cabinet in the spring of 1861, including Secretary of War Edwin Stanton. Simon Cameron, not Stanton, was Lincoln’s first Secretary of War. Robert E. Lee is said to have been a friend of Lincoln’s before the war. The two were not acquainted, though Lee’s opponent George McCellan appears to have had numerous dealings with Lincoln in the 1850s, and they established a friendship of sorts. Grahame-Smith writes that Our American Cousin was a new play in 1865. It was written in 1858. There are other hiccups – these just happened to stick with me. But guess what? Vampire’s aren’t real (at least, I think they aren’t). Unless you’re a fourteen-year-old girl, that shouldn’t come as any surprise to you. If you can overlook that minor detail, I think these little mistakes shouldn’t concern you much.